Select or enter a file in To File to which to save the exported data. The file extension will automatically be adjusted based on your chosen export format. Export Format determines the type of output. CSV, TAB, and TXT types are “flat file” types with rows of data values which are separated by a comma, tab, or space character respectively. You may choose to Include Column Headers to output the field names as the first line of the export (this is recommended for easy import into a spreadsheet or database). GPX (GPS eXchange) and KML (Keyhole Markup Language) are XML output types which are typically used for GPS tracking and visualisation. KML is the native format for importing into Google Earth and provides more features than GPX, while GPX is a more accepted standard for data exchange. Output Frequency determines how many records are exported per second of logged data. AutoQuad logs at a 200Hz rate (200 records per second). In many cases this is more data than necessary and can create very large export files. To limit the amount of data exported, select a lower frequency. For GPS tracking, a low value like 5 to 10 Hz is recommended, especially with KML or GPX exports which can create very large files even at low frequencies. Select Export GPS Data as Track to automatically include all data releavant to GPS position and speed tracking, as well as vehicle attitude data (heading, roll, & pitch angles), and an accurate time stamp. If you choose a flat file type output format (TXT, CSV, TAB) then you can also select other values to include in the export from the choices on the right. Column headings are automatically included. If you choose GPX or KML format, you also have the choice to output the GPS data as “waypoints” by selecting Export GPS Data as Waypoints.You can export this either in addition to, or instead of, the track data. The difference is mostly in how the data is plotted in programs like Google Earth. Exporting waypoint data can produce significantly larger output files and may take longer to process. Both KML and GPX files can be opened directly in Google Earth, although KML is recommended. You can also specify the minimum GPS estimated accuracy of the records you want exported. This eliminates the “no data” records before the flight controller aquires a GPS fix, and can control the accuracy of the data you are exporting. Typically anything with an accuracy great than 3 will be poor data. To ensure the dates in your GPS log are correct, make sure the Date of Flight field has the correct date. It is based on the log file modification date and may, or may not, be accurate. The time portion of the exported data will be correct regardless. Under Altitude Source you may choose thereporting source for altitude. The default is reported GPS data (GPS_HEIGHT). UKF Altitude is the altitude derived by AQ from GPS and pressure sensor data (UKF_POSD in the logs). Pressure Altitude means use altitude as reported by the pressure sensor. When using the last option, you will need to specify an Altitude Offset value, typically ~30 – 100 meters. Altitude Offset will adjust the final altitude value by this amount. This maybe be useful if portions your tracks are appearing below ground in mapping applications, or if you are using the pressure altitude. Select options to include a date/time value for each exported record. This is based on the logged GPS Time of Week (iTOW) and is calculated based on the Date of Flight field in this section. The default date shown is based on the log file modification date, which may or may not be correct. Even if the date is not set correctly, the time value will still be exact. Date and time is output in UTC (GMT) time by default. Select Adjust to Local Time to use the time zone information on this computer to change the timestamp to local time. You can use a radio channel as a “trigger” mechanism, for example to indicate a flight mode or a camera being triggered. 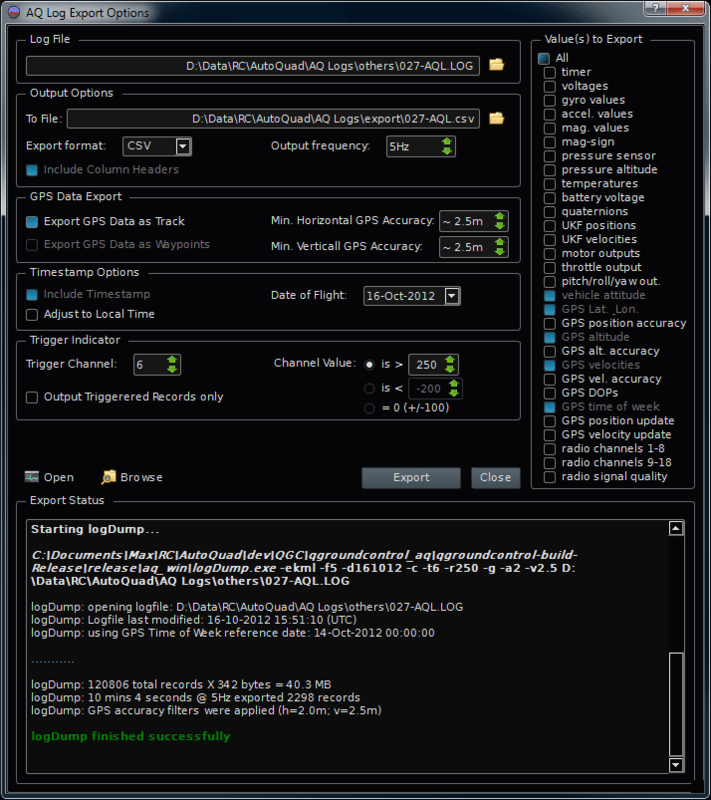 Also, in AQ firmware versions with gimbal triggering features (v6.7 b1378 and later), the dedicated log field can be used (select Use gimbal log record to trigger based on this log field). – For flat files (TXT, CSV, TAB), a column will be included which contains the current trigger count, or a zero (0). A zero indicates that the trigger is not active. – For GPX and KML export types, a special waypoint is created for every point in the track where the trigger is active. For example when viewing the output in Google Earth, each triggered waypoint will appear with a named marker (in KML format it will be uniquely colored to distinguish it from other waypoint types). Specify a Shutter Delay to attempt to pinpoint the actual time/location of a photo. This would be the typical time delay (in ms) between trigger activation and actual shutter opening of the camera used (eg. focus delay). Usually an active trigger will span multiple log records (since it is active for some amount of time), but if you specify a shutter delay here, then only one record out of each series will be marked as active. Note that the Output Frequency export setting can affect accuracy (you will only get the next record after trigger activation is detected + the shutter delay has passed). Select Output Triggered Records Only to only include records where the trigger is active. To detect triggering based on a radio channel, select the desired channel using Trigger Channel and specify a value in Channel Value. You have 3 options for the channel value: greater than a value (eg. a switch set to high), less than a value (eg. a switch set to low) and a value of zero with a buffer of +/-100 (meaning in the range -100 to +100, eg. to indicate a switch in middle position). This page was created on 17-Sep-13 by MaxP. Last modified on 21-Jan-15 by kinderkram.